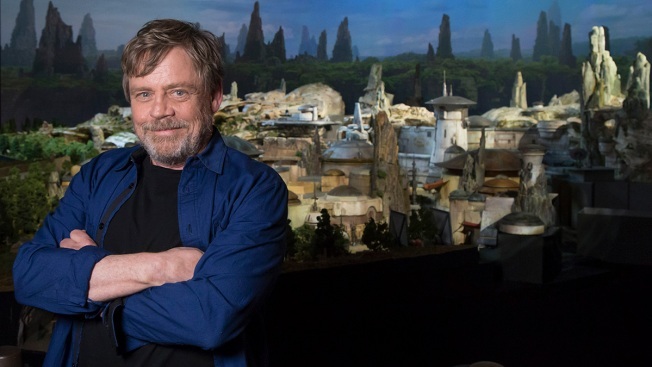 In this handout photo provided by Disney Parks, actor Mark Hamill visits Galaxy's Edge, the new Star Wars-themed land, at Disney Parks on July 14, 2017, in Anaheim, California. Just over a year ago, Disneyland Resort’s relationship with its hometown of Anaheim was tense. Now, the two sides have “reset” ties as the park prepares to open its largest single-themed land expansion ever, Star Wars: Galaxy’s Edge. “We are anticipating millions of annual new visitors here and a very positive impact on the revenue that we see from hotel stays but also to sales tax,” said Mike Lyster, a spokesman for the city of Anaheim. “There is no doubt that Cars Land had a serious impact on bringing more people here to Anaheim and had a very positive impact on the revenue we’ve seen." Disney’s’ Parks and Resorts division accounted for 35% of the entertainment giant’s total revenues in fiscal 2018 and was second only to the Media Networks segment. Disneyland, with about 30,000 employees, is the biggest employer in Orange County — a Southern California area with about 3.2 million people. The company expects an increase of 1,400 employees as a direct result of its investment in Galaxy’s Edge, which includes several attractions with interactive features. However, Disneyland’s relationship with Anaheim — a city of more than 350,000 people — grew strained just a few years ago when some elected city officials suggested they regretted corporate subsidies or breaks from future taxes, which The Los Angeles Times estimated back in 2017 had totaled over decades more than $1 billion (a figure Disney officials have called “completely inaccurate”). Last October, Disney canceled a planned luxury hotel project near Disneyland after a tax rebate was pulled by the city that reportedly could have saved the company more than $250 million. Regardless, Anaheim still continues to have challenges like other cities with costs of public-safety personnel, pensions and more. But the tourism taxes have provided a steady source of revenue for the city as visitor traffic to Anaheim has increased more than 30% since 2013. The way that California’s tax system is structured means that city governments don’t have a lot of authority over their own local tax rates so tourism taxes are seen as especially helpful.